1. In a medium-size bowl, place the rice and fill the bowl halfway with water, to cover the rice. Gently rub the slender grains through your fingers, without breaking them, to wash off any dust or light foreign objects (like loose husks), which will float to the surface. The water will become cloudy. Drain this water. Repeat three or four times, until the water remains relatively clear; drain. Now fill the bowl halfway with cold water and let it sit at room temperature until the kernels soften, 20 to 30 minutes; drain. 2. 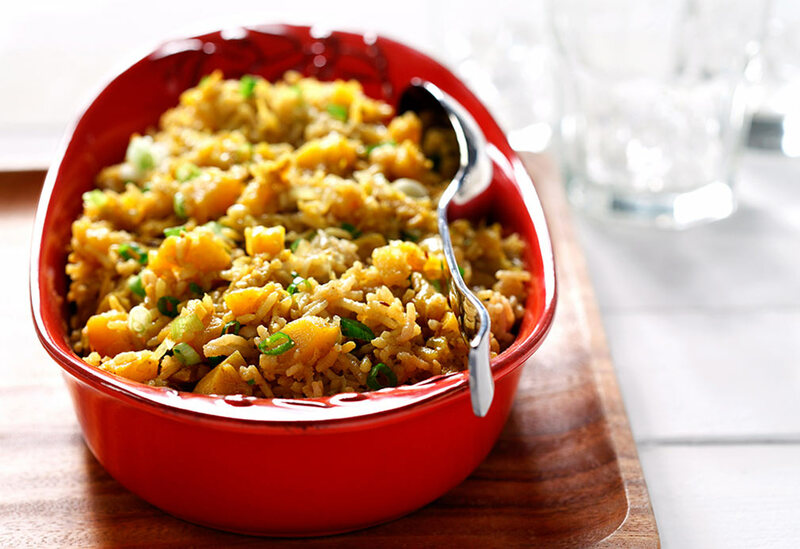 While the rice soaks, prepare the squash by cutting it in half. Scoop out and discard the seeds. Peel the tough skin with a paring knife or potato peeler. Cut the meaty flesh into 1/2-inch cubes (1 cm). You should have about 6 cups (1.5 L) cut-up cubes. 3. In a medium-size saucepan or Dutch oven, heat the canola oil over medium-high heat. Sprinkle in the cumin and red chiles. Once the seeds sizzle and look reddish-brown and the chiles blacken, 10 to 15 seconds, add the squash and onion, and stir-fry until they are light brown around the edges, about 5 minutes. 4. Stir in the curry powder and salt. The heat from the ingredients in the pan will allow the ground spices to cook without burning. Immediately add the drained rice, and coat the grains with the yellow-tinted onion and squash by tossing them together gently. Pour in 3 cups cold water (750 mL). Stir the rice once to incorporate the ingredients. Allow the water to boil, still over medium-high heat, until it has evaporated from the surface and craters are starting to appear in the rice, 7 to 8 minutes. Now (and not until now) stir once to bring the partially cooked layer from the bottom of the pan to the surface. 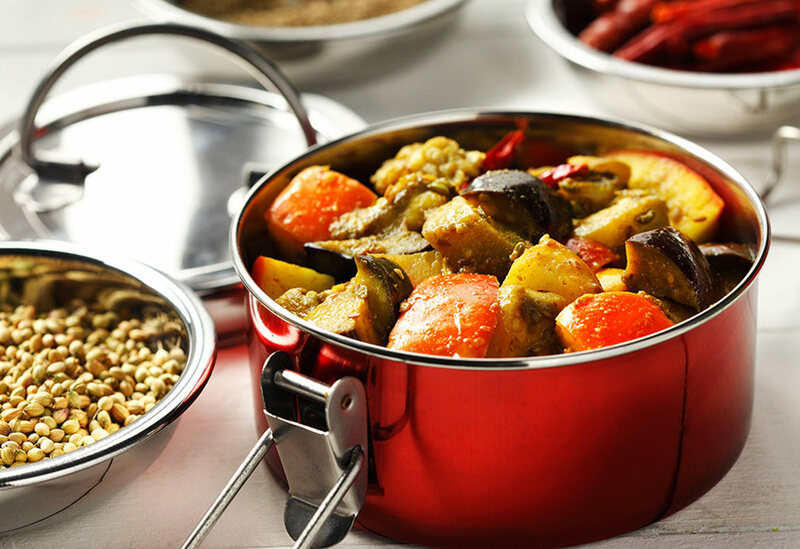 Cover the pan with a tight-fitting lid and reduce the heat to the lowest possible setting. Cook for 8 to 10 minutes on low. Then turn off the heat and let the pan stand on that burner, undisturbed, for an additional 5 minutes. 5. Uncover the pan, sprinkle in the green onions, fluff the rice with a fork, and serve. Tip: Either remove the chiles before you serve the rice, or make sure the folks at the table are alerted to their pungency. This summer recipe is easy to put together, and uses up those pervasive cucumbers from your garden patch. It is downright cool, crunchy, hot, nutty and entirely addictive  you are going to love it! While pork and apples may seem like a steadfast couple, eggplant does a mean tango here, tapping pork out of the picture and weaving in exciting flavors with fennel, cumin and coriander. The spices breathe assertive aromas into the canola oil and add a vibrancy that will appeal to any palate you aim to please. 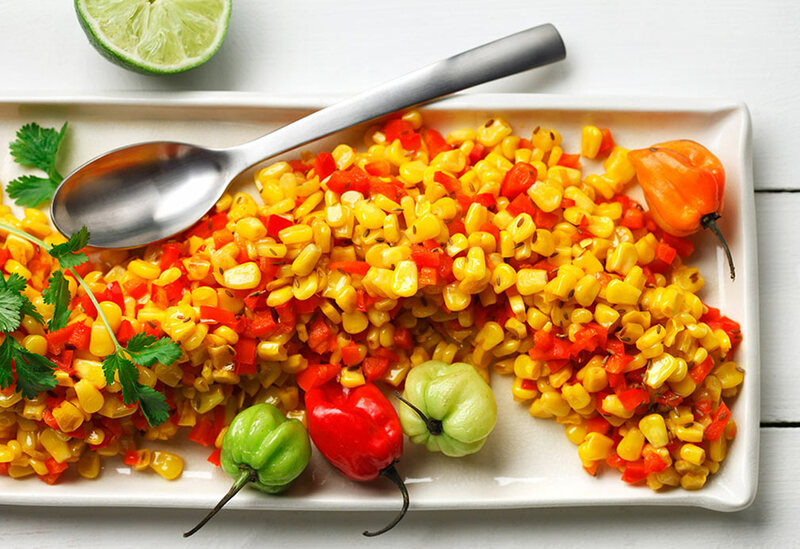 Nothing screams summer more than golden kernels of corn with their natural sweetness and succulence. 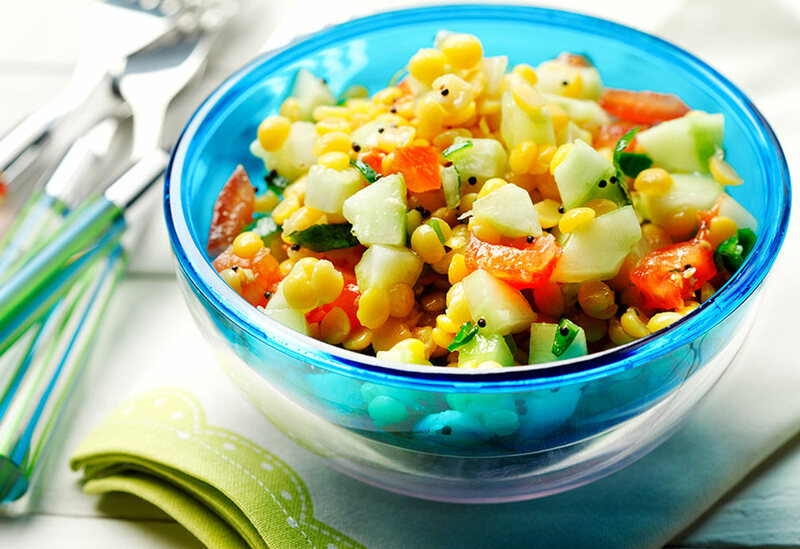 When sweet corn overflows the bins at grocery stores and farmers markets during hot months, this recipe is a perfect accompaniment to the meats from your barbeque. You may very well set the main course aside and dig into this hot and tart sideliner.